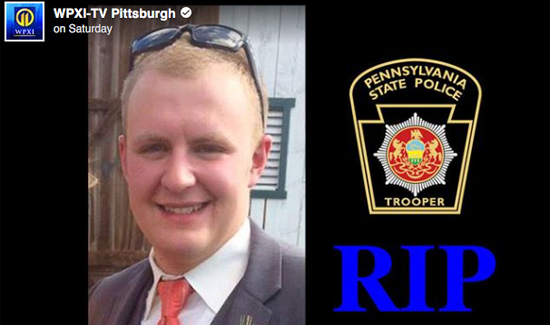 A Pennsylvania State Police trooper was shot and killed Friday night in Huntingdon County. The shooting happened around 6:30 p.m. at a home on Baker’s Hollow Road in the town of Hesston, which is about 120 miles east of Pittsburgh. According to a Pennsylvania State Police release, the trooper was called to the home for a protection from abuse order violation. The trooper was identified as Landon Weaver. He enlisted in December of 2015 and was assigned to the patrol unit out of the Huntingdon barracks, according to State Police. Investigators are searching for 32-year-old Jason Robison in connection with the shooting. Officials said his hair is believed to be dyed purple. He is to be considered armed and dangerous. “On behalf of all Pennsylvanians, Frances and I extend our deepest condolences and prayers to the family and friends of Trooper Weaver and all members of the State Police across Pennsylvania in this moment of tragedy. Landon will always be remembered for his bravery, his sacrifice, and his willingness to serve.